Pershing continues the X and presents the second chapter of the series the 9X. This new generation X is a maxi super sport yacht coupe with aggressive lines and lavish comfort. The new 9X has a broad use of carbon as the main construction material, along with fiberglass and epoxy resin. Based on the hull of the 92, the 9X continues Fulvio de Simoni vision for the brand as started with the 70 model in the fall of 2014, and followed with 5X in 2016. 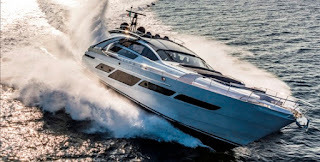 The result is a powerful yacht in the sea, rich in fittings and equipped with numerous technological innovations that offer a unique navigation experience and ease of maneuver, even in confined waters, unthinkable on a yacht of 28 meters in length and with surface drives. The prestigious ten-year collaboration with Poltrona Frau also gave birth to a magnificent design: an extremely sporty dashboard, a stylistic and technical masterpiece. The Pershing is offered in two lower deck layout choices for four or three double cabins. In the optional three cabin layout one of the twin berth cabins is replaced by a dinette, with the head of this fourth cabin becoming a walk-in wardrobe for the VIP suite forward. A nice feature in the 9X is the day-head in the stairway which leads from the main deck to the cabins. Galley and crew cabins are located at midships in between the engine room and owners midships stateroom. Power for the 9X comes from twin MTU 2638hp with top speeds up to 42 knots. The 9X is proving a commercial success for Pershing with the fourth hull receiving order in the first days of the Cannes boat show.